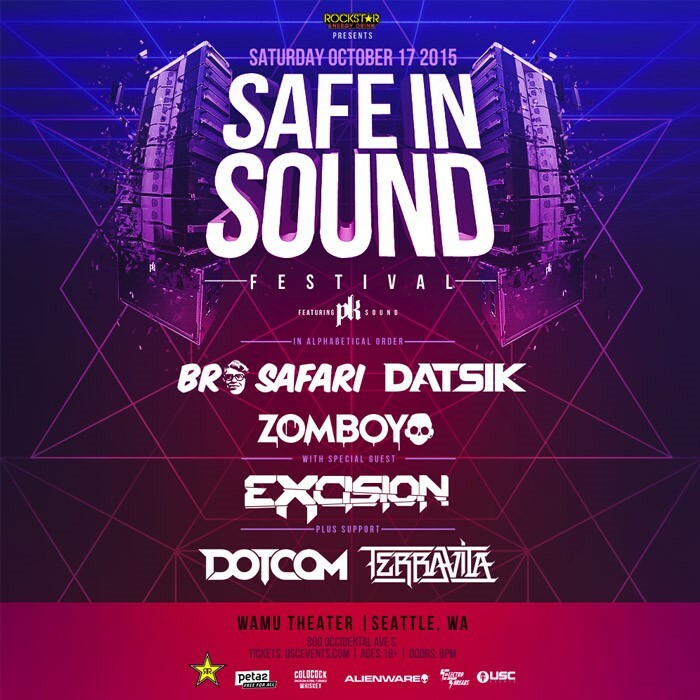 EmeraldCityEDM | Safe In Sound Fest – Seattle: Bro Safari, Datsik, Excision, Zomboy & More! Safe In Sound Fest – Seattle: Bro Safari, Datsik, Excision, Zomboy & More! Update 10/5/2015: Safe In Sound Seattle is officially SOLD OUT! Safe In Sound Fest returns to Seattle on October 17th, 2015! Remember last year’s Safe In Sound which brought 150,000 watts of bass to the WaMu Theater? We do and we can’t wait to hear the WaMu get rocked again! See the full listing of locations by city online here. –ENTER TO WIN 4 TICKETS & a backstage tour with Terravita! -Comment on this photo & like this page on Facebook to enter to win VIP tickets to Seattle’s Safe In Sound! Stay tuned to this post for more information, tickets and other news. Stay up to date on upcoming EDM events in the Seattle area by following the EmeraldCityEDM Event Calendar, and enter to win free tickets to local EDM shows on the EmeraldCityEDM Contests & Giveaways page. HEADS UP: Ticketmaster is defaulting to the express 3-day shipping option when buying online, be sure o select the regular shipping to lower the price. For the cheapest fee-free tickets, purchase in person at the WaMu theater box office or at Silver Platters Bellevue, Lynnwood or Sodo. Want to win 4 tickets to Safe In Sound Festival with Excision, Bro Safari, Datsik, Dotcom, Terravita, and Zomboy; plus a bag full of Safe In Sound merchandise and a backstage tour with Terravita? Well you’re in luck, SafeInSound is giving away 4 tickets to the tour stop of your choice! Heads up: Safe In Sound Festival Seattle is nearly sold out! Grab your tickets soon to ensure entry. The cheapest tickets are available at the CenturyLink Field Box Office. Xs up!